Tidy your house, mice love clutter to hide in. Block all holes entering your property. Do not leave food especially crumbs on surfaces or floors. Check property once a week. Mouse control is essential for maintaining good sanitation in the home. Mice are pests that can carry disease. They can contaminate foodstuffs and water, if allowed to, and they will do considerable damage to any home where they are allowed to roam free. Eliminating mice from your home is not difficult, and will not cost much either. Here are a few mice control tips to help you get rid of them and maintain a mouse-free home. Visit here for a full set of instructions on how to get rid of mice. Controlling house mice starts with a clean house. Mice love clutter and mess where they find it easy to build their nests and raise their young. Go around the outside of your house, starting at the foundations and working up to the top of the roof, and seal every crack, gap and hole you find. Mice can get through a hole no bigger than the tip of your finger, so don’t overlook very small gaps. 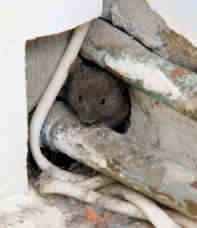 Mice are only in your home because they have found a food and water source, so eliminate it. Don’t leave crumbs on the floor or on kitchen work tops, and always keep foodstuffs in sealed containers when not in a refrigerator. Decide whether you want to use mouse snap traps, glue traps, electronic mouse traps, rodenticide and a mouse bait station or humane mouse traps. Get as many as you think you’ll need to do the job. You need to decide on what bait will work best. You may have to experiment to find out what works best, but peanut butter, chocolate, bacon and materials like cotton wool all usually work well. Once you decide which to use, bait every trap. You need to conduct regular checks on your house and out buildings. Once a week is not too often if you have a mouse infestation. If you think you have managed to get rid of all the mice, then perhaps every two weeks would be fine, but check regularly, and check thoroughly. 7. Repeat these mouse control tips whenever you need to. Keeping your house totally free from mice all the time is difficult, though not impossible. It is possible that you will have mice back in the house sometime after eliminating them. If that happens, these mice control tips should be all you need to become mouse-free once again. Learn how to get rid of mice as well as how to set traps, where to put them and how to dispose of the mouse once it has been caught. This article gives you clear step-by-step instructions on how to prevent mice from getting into your property. A few facts about mice to help you understand the habits and behaviors of this little rodent. Is It Possible to Get Rid Of Mice Naturally? It is possible to get rid of mice naturally, it is a lot more difficult than using traps. However, if you use best mice control practices you can have good results. 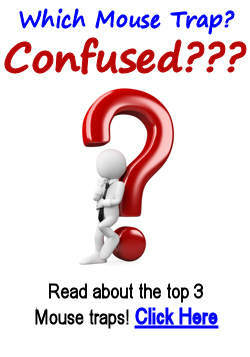 What Are the Different Types of Mice? There are over 1,100 different types of mice. The more common ones are the “House Mouse” the “White Footed Mouse” and the “Field Mouse”. My wife and I recently moved into a new home but found mouse droppings in the basement just the other day. I like your point about sealing up any cracks and holes you find outside. We’ll have to check around the whole house and find places that they are likely getting in. Thanks for sharing.